And will they even be together?" I just. I don’t even know what to say about this book. It. Was. Awesome. Like so awesome, I literally stared at the last page of the book for about thirty minutes before my mind could even begin to process anything else. There is a reason this is my favorite series and this book is exactly why. JLA had stated previously that this book would change everything about the Lux world and she wasn’t kidding. Nothing will ever be the same again. Katy is seriously one of my absolute favorite heroines. She is strong without being in your face about it, she breaks down without coming across as whiny, and she is determined to do whatever she needs to do and most importantly she is a survivor. Katy is faced with some very difficult situations in Origin and while they change her, she is determined to not let them break her. I can’t help but admire her and love her. I also still love that she is bookish. Even though that has started to take a back seat in her life, it still peaks its head out every now and then. Then of course there is Daemon Black. In case you missed the memo, or don’t drop by here a lot, Daemon is my favorite fictional character… like ever. I even named my car after him. And let me just tell you, he somehow outdid himself in this book. I love his wit and his sarcasm and his bad attitude. I also love his sweet side that I am so glad we get to see more and more of. Now this is something I am sure most Lux series fans have been waiting for. With Origin we get dual perspectives and have the pleasure of being inside Daemon’s head. And yes it is as awesome as you were hoping it would be. I love the dual POV. I thought it added a whole different layer to the story and expanded a world you thought you knew. Also, it is great to see what he truly thinks of Katy, to see behind his sarcasm and wit and quick remarks and to see how he truly feels. But don’t worry, most of the time he thinks just the way he acts and I loved it. As I said before, this book changes everything. Honestly, a lot of it shocked me. I say this with most of my JLA reviews, but I never see the twists coming because I get so engrossed in the story that I don’t even stop to try and figure it out (although I did guess one thing, but I’ll attribute that to me being a genius haha). But even if I do guess a twist, I never care because the story is just that good and I’m never completely sure in my guessing. JLA definitely put a bunch of surprises into this book and she is not afraid to take risks. I was floored by a lot of what happened. I never ever want to hear someone say JLA doesn’t do the unexpected because she does. Now for a little thing I need to mention. I always love how JLA sneaks in other book references into this series. It always makes me giddy. With this one we get a very subtle Hush, Hush reference that left me fangirling (I am a HUGE fan of that series) and we also get a not so subtle Sweet Evil reference that had me smiling like a goober. Those are two of my favorite books, so I loved that they were mentioned in my favorite series. 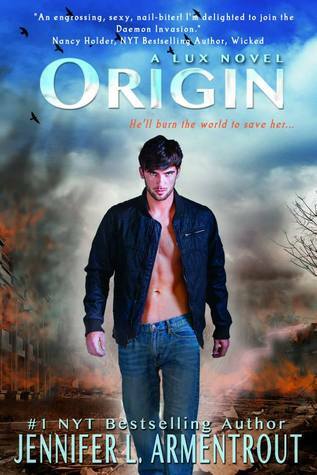 Origin is a book that will leave you desperate for the conclusion to the series. Things are definitely going to get serious (well more serious) in the next book and I can’t wait. I have no clue how this is going to wrap up and I can’t even begin to fathom how everyone can possibly come out unscathed. I just, I need the next book okay *twitches*. Jeeze it’s like I’m a junkie. The only thing that helps me cope is knowing that between Origin and the yet to be named final book there will be other awesome JLA books for me to gobble up. Okay, so just in case you missed the pretty much raving review, I highly recommend this series. It is awesome. The End. I love your review Teresa! You know all my fangirlish thoughts about the book bc I texted you like crazy and I'm so glad to have you to share my craziness with. Yes, I loved being in Daemon's head and I loved all the bookish references. Jen is so funny with that. This one was definitely a game changer. P.S. Not to drive you crazy or anything, but a little birdy told me the name to Book 5 and it's pretty intense! Lol. I can't wait! I'm really trying not to be jealous right now, but girl I really need this book. I can't wait any longer and here you are all fan-girl about it and it sounds so amazing. Great review, but still you're killing me. I loved this review so much! I cannot wait to get my hands on it! I can't wait to see all the changes, what is going on, to see more Katy and Daemon. To get inside Daemon's head (I'm really most excited about that). And to see all the twist and where this story is going! Teresa, I'm dying to know what is going on!! Your review made me both excited and anxious!! LOVED YOUR REVIEW MY GOOD FRIEND! Ha! I'm not even a little bit surprised that you loved this. I'm very behind on the series, and also curious about the twist. LOVED your review!! I am absolutely ecstatic to read this one! Already preordered it too! And come August 27th--I will regret such decisions because it will involve more waiting while everyone is reading it! So this might possibly be the only review I will read since it's so early! Thanks for that!! Rather read one or two early ones before it's out and I am waiting on that post man/woman or whoever to get my book to my doorstep asap! I too love the little references to other YA books! I can't recall which one it was...possibly book one or maybe 2, but it referenced Soul Screamers and Katy's new book BF Tod!! Never read Sweet Evil but will happily look forward to the Hush, Hush reference!! Once again fabulous review! I adore this series as well and can't believe I waited so long to pick it up--started it just before book 3 released--which was wayyyy too long to wait! It really is a fantastic book and you will love it. I loved the Soul Screamers reference, its actually what made me pick up that series and now it is one of my favorite series ever! Reading this NOW! Almost done and I definitely agree! So good! YES! I wanted Daemon's POV, for that reason exactly. I want to see how he really thinks/sees Katy! I think dual POV is so important in books, because I feel like I can really tell if the other character is genuine or not in their feelings! I cannot wait for more Daemon and Katy! Awesome review Teresa!!!! Reading all these awesome reviews makes me so so impatient to read the book, lol. Amazing review, Teresa, and I seriously cannot wait till the 27th! LOVE this fan-girly review! I'm so glad I finally jumped on the JLA bandwagon! I can't wait to read this one so we can have a huge squee-mail fest! Also, had a huge mental image of you 'smiling like a goober,' and it made my day. Love this review, love Katy and Daemon, and love YOU! OMG!!! TERESA....I CAN'T EVEN....!!! *runs around in circles screaming* I cannot wait to get this book in my hands and just eat it up. I want to know what the twist is, and how Daemon's POV works out here. Also, I just want to know if everything will be okay! I had no doubt you would love this, but your review is freakin driving me crazy!! And I totally agree with you....this series is an absolute fav of mine!! *SQUEE* Ohhh...and I LOVE Jennifer's book references too! :D They always make me laugh! HAHAHA I cant wait to discuss this book with you. I know you are going to love it too!